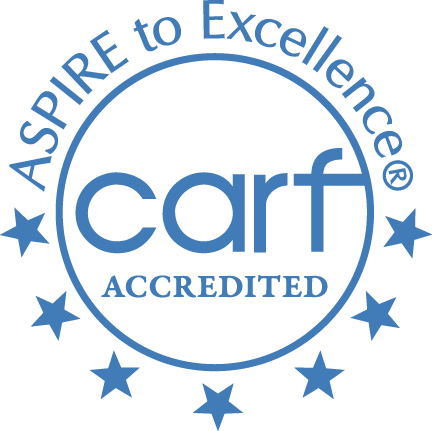 BlueSky is a CARF accredited national and local provider of mental health and addiction treatment services. BlueSky's ETP In-Residence Clinic Program is attended by people from throughout the United States including Florida, Georgia, California, Texas, New England, and the Mid-West. BlueSky's Partial Hospital (Day Treatment) and Intensive Outpatient Programs serve people in the greater Danbury CT/NY region. BlueSky's programs are affordable and covered by insurance in most cases. Ask us how we can help you with your high deductibles. If you live outside of the Danbury CT/NY region, or you need a respite from your home environment, then you will want to learn more about our ETP In-Residence Clinic Program: "Get Away and Return Home Well." ETP is not residential treatment. It is an innovative alternative. If you live in the Danbury CT/NY region, our PHP and IOP standalone programs can help you. The BlueSky Partial Hospitalization and IOP Programs provide a high level of quality care that respects our clients' individual needs and strengths. Our focus is on your recovery and wellness. BT has an addiction to cocaine and alcohol. In addition, he had struggled for years with untreated depression. BT has been very successful in sales, but found himself using almost all of his money to feed his drug and alcohol abuse. This put a huge strain on his relationship with his fiancé. BT would frequently find himself sitting in his shower after a night of binging on cocaine and alcohol, barely able to move. As he would stare over his balcony, he would contemplate if life was worth living. As BT's addiction grew, he found himself engaging in risker behavior and his relationship was about to fall apart. At that time, BT decided to get help and was referred to Blue Sky. He had only seen a therapist and psychiatrist in the past, being rather new to treatment. He was initially guarded and used humor to try to avoid dealing with some painful struggles he had in child and adulthood. During his treatment at BlueSky BT was able to open about major losses in his life, he identified how depression impacted his desire to escape through cocaine and alcohol, and he utilized both Dialectical Behavior Therapy techniques and Kill the Craving Skills to improve coping and insight. BT also successfully remained abstinent from drugs and alcohol during and after treatment. BT left BlueSky's In-Residence Clinic's Enhanced Treatment Program after 45 days, but continued to attend a few groups and individual therapy. BT eventually discharged completely from BlueSky, but still keeps in touch with his therapist, happily reporting that he passed his 2 years of sobriety mark, is married, and was able to buy a house. RD had been struggling with Borderline Personality Disorder, Depression, and Post Traumatic Stress Disorder (PTSD) for several years. She had been involved in many treatment settings, including, 4 inpatient hospitalizations, residential treatment, several IOP/PHP programs, and outpatient therapy and medication management. RD had resorted to cutting and burning her arms and legs as a way to try to alleviate her feelings of shame and intense emotional turmoil. In addition, RD made two suicide attempts during a particularly dark time in her life. When RD came to BlueSky she was feeling hopeless and did not have a lot faith that anything could help her. Her therapist at BlueSky and our therapy dog were able to connect with her almost immediately, helping her to gain trust and hope that things could change. RD worked hard to learn Dialectical Behavior Therapy Skills and was provided support in group such as Women's Trauma, Motivation to Change, Yoga, and Borderline Personality Disorder Support Groups. In addition, she utilized Eye Movement Desensitization Reprocessing (EMDR) to help her overcome the many symptoms of PTSD. As RD progressed in treatment, she was able to refrain from any forms of self injury, got a job, started setting healthy boundaries in relationships and ultimately left BlueSky with hope and optimism.